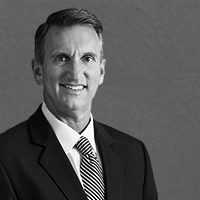 Before joining Fulcrum Partners LLC as a Managing Director, Monte Harrick was affiliated with a Los Angeles-based executive benefit advisory for more than nine years. As a Managing Director, he specialized in working with large corporations in attracting and retaining top talent, specifically as related to executive benefits. His responsibilities included analyzing and consulting with corporations on the design, funding, and administration of leading nonqualified benefit plans and welfare benefit plans. With a solid history in executive benefit consulting, Monte has been a Senior Vice President at Clark Consulting (1999 – 2008) and previously at Compensation Resource Group, CRG (1993 – 1999). His areas of focus have included: consulting on nonqualified benefit plans, designing funding vehicles to finance benefit liabilities, reviewing and recommending security devices to protect executive benefits, and coordinating the placement of administration teams to handle client nonqualified plans. Committed to helping young people, Monte has spent 15 years planning and supervising annual week-long youth trips for over 120 teenagers, setting up youth workshops and activities geared to building self-esteem and self-confidence. With a passion for sports first fostered by his dad, NCAA Men’s Basketball Championship Coach, Jim Harrick, (UCLA 1995), Monte has devoted countless volunteer hours to youth sports programs in the Greater Los Angeles area. Consulting with large and small corporations in helping their key employees delay the taxation on compensation for as long as possible. Accomplishing this objective by assisting these companies in designing creative pre-tax and after-tax savings strategies that fit the culture and goals of the organization.